Today is THAT day. The day that ‘s circled on the calendar. The day that, when mentioned, makes my heart wince. Yeah, THAT day. Today I’ll say goodbye to my beautiful daughter and son-in-law as they make their way to NC. To be together FINALLY, as husband and wife, in the same home. 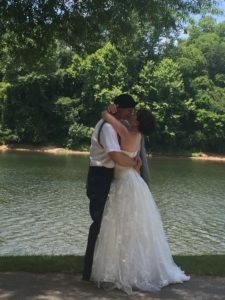 To start their own traditions and memories in another state, that’s not Georgia. I knew it was coming. THAT day. And I was given a whole year extra from the day they said “I do.” The military gave me the extra year and I’m very grateful. But now I must say, not goodbye, but see you later and I love you bunches and I’m gonna miss you a ton….and my heart hurts. You see, my Megan, my Mae Mae, is my child who shares my passion for all things animal and outdoors. Since she was little, she’s been my right hand helper. As she’s grown and we’ve shared our passion together, I’ve cherished our long talks, the laughter, discussions about life and marriage, and her hugs. Yes. I will definitely miss her hugs. Megan has been our family defender and she can be fierce when she thinks someone is harming one of her own. Even when she was a little thing, she was a force to be reckoned with! I love this about her. And I love her husband….which makes this life transition a little bit easier. But only a little. This is my third child to move out of state. No longer a 10 minute drive away. These last couple of years have found me soul searching, realizing my title of “mom” is taking on new meaning and responsibilities. It’s not easy. Lots of tears, alone, trying to make my head and heart accept this new phase of life. And I get caught. I’m excited about the future and the realization that there is now a freedom to pursue some dreams that have been put on hold. But there is also a sadness realizing that my most favorite, privileged occupation ever, will no longer be the same. As I got closer to 50, I remember women talking about the “change.” THE change nothin’! Everything changes!! The physical, the daily routines, life’s perspectives, the noise level and activity in the home, the amount of groceries to be purchased….everything as I had known it for 20+ years. And now I’m 55. I’m settling into this new phase slowly. It doesn’t mean that the changes still aren’t coming. Just means I’m learning how to handle the changes, make adjustments, and accept this new “mom” role. And so, today, THAT day, as I hold my Mae Mae close, kiss her cheek, pray with her, and watch her drive through the front gate with her husband, my heart will ache and tears will flow, and there will be a thankfulness. A thankfulness for the “extra” time I had with her. A thankfulness for the beautiful young woman she has become. A thankfulness for a wonderful relationship between mom and child. And gratitude for her loving husband who will watch over, care for, and love our Mae Mae. No. It doesn’t get easier. Each child is unique in their own beautiful way and there is a void. A hole in my tapestry of home life when they leave. And I grieve for a bit….. and then the salve of my faith permeates all that I am, and I’m ok. I find my new normal, cherish my memories, and celebrate in who my children have become. I am so very blessed. My youngest is a Senior this year…. I’ve already circled THAT day. So beautiful! Thankful you have been blessed with such beautiful, children a true reflection of their momma!! Hugs to you today!! So grateful for friends like you Trina as we travel this road together <3 And thanks for the hugs! My heart aches with you. Sometimes I still struggle, on occasion, with this norm. But I am blessed with 4 beautiful grandchildren who live fairly close. I LOVE being a grammie! I think of you often and wish we could get together and walk our farms. Me too Robbin! I want to get back to WA and when i do, you and i will definitely take that long awaited walk. Great post, Cindi! Thanks for sharing. I love that no matter what season of motherhood we find ourselves in, we need the Lord to guide us and hold us. I loved your last line, “..and then the salve of my faith permeates all that I am, and I’m ok.” I can apply this to my life with a 3 year Noah, 2 year old Kayla, and 9 month Nathan that I care for day in and day out. Oh how we need the Lord. Thanks for sharing your journey. Lots of love from California! No one gave me a heads up about this part of the raising kids thing before my first one moved out. I thought I’d be ready mentally to see him fly. Ha! I cried like a baby…and not just while he was pulling away. I thought I’d be plenty distracted with 3 more to school and the farm work to carry on. Yeah whatever! I didn’t realize how often we talked and prayed and played and went on outings for 19 years. I’m proud of the man he is becoming but it was so fast! Oh my Cyndi, this surely got the tears flowing. Very well written, and oh, so very sweet???? 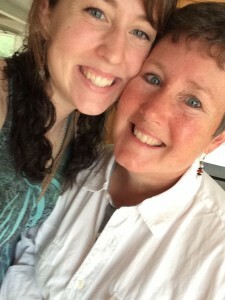 So thankful i’m not alone in this part of the “mom” journey…. Thank you for your friendship! Thank you for sharing your heart! Your girls are blessed to have a mom like you. Your future generations will be blessed, too.